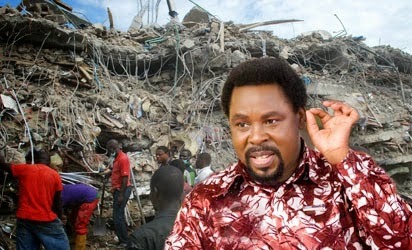 In reaction to the collapse of a 6 storey guest house belonging to the Synagogue church which resulted in the death of 115 people ,a human rights group, Vote for Service Initiative has written a strong worded letter dated September 25, to the Lagos State governor . They are demanding the immediate persecution of TB Joshua and accused the government of treating him with leniency based on the ‘Touch not my Anointed.’” excuse. “We are Vote for Service Initiative. We like to remind your good office that, it was in this state your attorney general and commissioner for justice prosecuted and convicted Rev. King to death by hanging for (killing) one of his devotees with ignited fire.